Last night I was looking to throw together a quick supper after swim lessons. You know how it is....swim lessons run from 5:00-6:00 (right during my usual dinner prep time), so when we get home close to 6:30, I have just a little bit of time to fix dinner before everyone gets "hangry." That's our new family term for when hunger produces anger. I am hangry often if I do not eat on time. So, in trying to utilize a few ingredients I had on hand, namely my Romaine lettuce from the CSA, I remembered a post from the Pioneer Woman a friend had used recently for lettuce wraps. It sounded delicious, except that I don't do tofu, but I thought I would substitute chicken in place of the tofu. In a medium skillet, heat olive oil over high heat. Cut chicken breasts into small pieces, dabbing with paper towels to remove any excess moisture from meat. If you want to get a nice, brown color while cooking your chicken (which you do, trust me, it's tasty), the paper towel will absorb extra moisture to help that process along). Cook chicken for several minutes until lightly browned and cooked all the way through. Once chicken is cooked, add corn and saute together for a minute or so. (If I had thought it through, an onion would have been a nice addition at this point. Next time!). Sprinkle some chili powder over chicken/corn mixture for flavor. It's a very subtle heat, so if you like the flavor and tender heat, add more; if not, just a bit will give the meal the boost it needs. I sprinkled the chili powder once over the entire skillet. Add a bit of black pepper to taste, if desired. Allow the chili powder to heat, then slowly add in soy sauce. The recipe I referenced called for 1/4 cup of soy sauce, but that was too much for the amount of chicken and corn I had. So depending on how much your chicken and corn ends up being, use your judgment. Allow to cook for a minute or so, then remove from heat. Place lettuce pieces on a plate, and spoon the chicken/corn mixture over each. Serve immediately! This was really yummy and super simple. I ate the leftovers for lunch today and will definitely be making it again. As I mentioned above, I will be sure to add water chestnuts and sunflower seeds for some added crunch next time. For a while now, I have been interested in taking advantage of all of the wonderful, delicious, locally grown produce that is available to us living here in East TN. There are several local farms that over a crop share for a fee where you are guaranteed fresh, organic fruits and vegetables available for pick up every week. Jonathan and I did some talking and a bit of research and decided that we would give it a try. Doing the math, it broke down to a reasonable amount of money each week and guaranteed us fresh, seasonal food that was also organic. 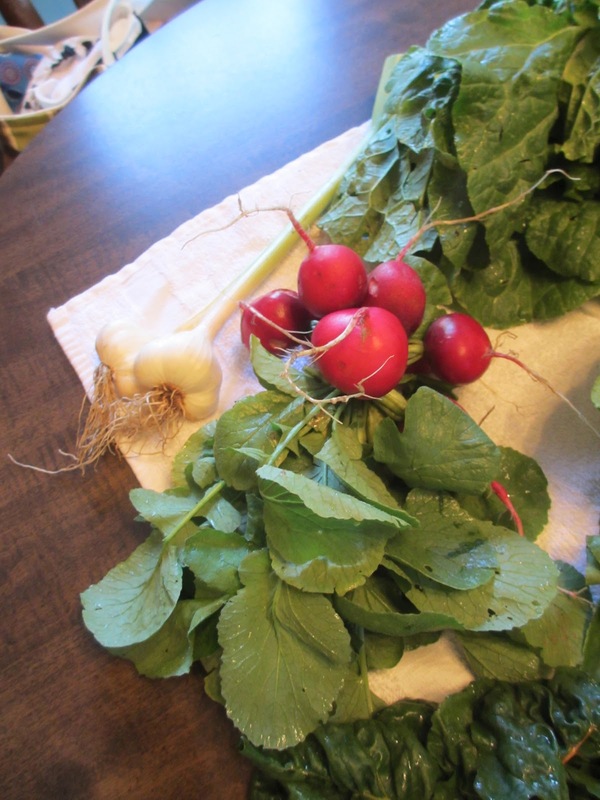 Our first harvest from the CSA (crop share) that we joined arrived last Thursday. We decided to take on this endeavor with some friends of ours, the Slagers, so we are actually sharing a large "box" each week. Mia Slager and I take the time to divide the spoils each week and also share ideas on how to cook and prepare each thing. It's only been a bit over a week, but we are already loving it. Isn't this a ton of food!? Now, keep in mind that this is the entire large share that Mia and I split. But even after we split it, we had tons of fresh produce. This first week included fresh strawberries, two heads of cauliflower, two heads of broccoli, radishes, garlic, leafy green lettuce, romaine lettuce, and Swiss chard. Things I learned from my first week: When Mia brought the food over, we washed everything quickly and divided up the food. I found out through the course of the week that some of the lettuce did not get washed well enough. So, last night after we got our second week's worth of food, I washed everything very closely. I took every piece of fresh lettuce and washed it well, removing all dirt. This will hopefully diminish our loss of food and will keep any little creatures from living and eating off of our veggies before we consume them. (I did find a little caterpillar that had fattened up on my broccoli last week). 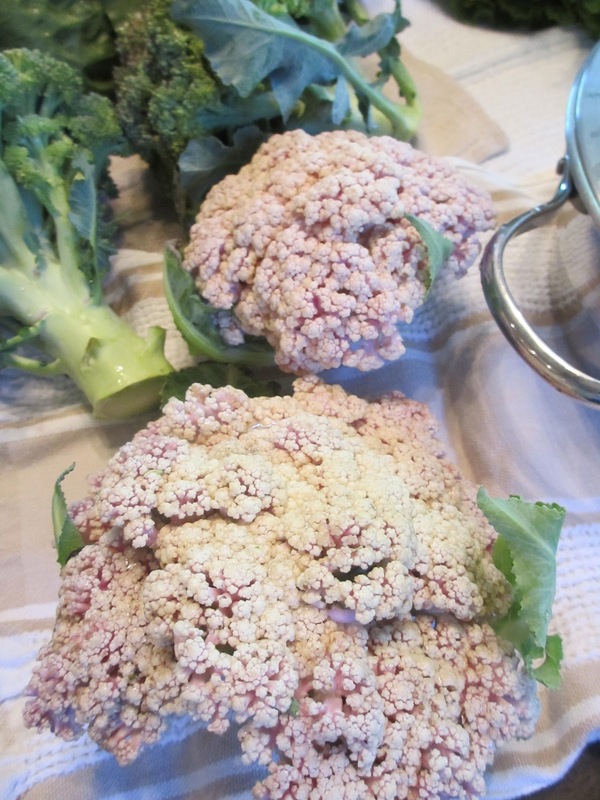 Cauliflower: When it came to cooking the cauliflower, I followed a recipe that my mother-in-law suggested. It's so simple. Basically, you cut the stalks of the cauliflower a bit shorter than usual. You want mostly the tops off. I tossed it in a bit of olive oil, salt and pepper and roasted it on a lined baking sheet at 350 until the cauliflower was pretty brown. It wasn't just tender, it was browned. The flowerettes crisped up and actually seemed to take on an entirely new flavor as they carmelized in the olive oil. Delicious! Our kids tried it because Jonathan and I were raving about how delicious it was. These berries were so ripe and so sweet that they made the strawberries I typically by at the grocery seem terrible. I must confess that only I enjoyed these berries. The kids were sleeping over at the grandparents' house, and I couldn't stop eating them. They were gone before I went to bed that first night! These were the largest radishes I have ever seen! This is how I wash and dry the lettuce before storing them in the fridge. This way I hope to get the longest life out of them! I wrap the lettuces in paper towel to absorb any excess water after washing them and store them in Ziploc bags. It seemed to work pretty well this first week. As far as other things I did with the produce, we made taco salads on Memorial Day with the lettuce and I gave my radishes to my in-laws. I am not a fan! I still have the Swiss chard which I am going to sautee this weekend to have it wilt with some olive oil in a skillet. I do want to show you a picture of the produce I received yesterday for our second week. This is a picture off of my phone, so the quality isn't that great. This is just my portion, but as you can see, it's a ton of food. 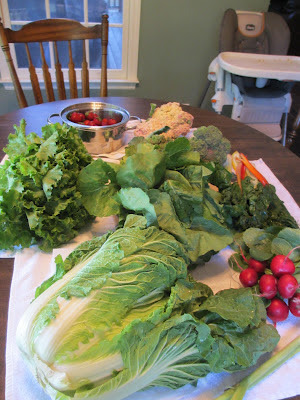 We received a huge head of cabbage (which I cut in half for Mia and I), another huge head of romaine lettuce, a head of red bibb lettuce (I think), fresh spinach, strawberries, and some squash and garlic. I hope to make some yummy stuff this week including some chicken lettuce wraps! Also, I may experiment with making a green smoothie with my fresh spinach, but if not, I'll just wilt it as a side-dish for dinner one night this week. I am loving this food challenge! I really love to cook and having access to these wonderful foods is not only beneficial to our health, but it is pushing me to cook more and to cook healthfully. Our kids are open to trying new things more than they ever have before. I hope that this experience continues to benefit us and broadens our horizons a bit! So far, it is really fun and really tasty! I will do my best to document some of our food and how things are going with the CSA. I won't even try to plan for a weekly post because--as we all know--I won't be able to keep up with that. We have lots of busy weeks ahead, so I will try my hardest! Do any of you participate? If so, I'd love to follow along on your journey and find out what you are doing with your food. I love new recipes! Here is another Pinterest Proven recipe I have made several times now. It is so simple to throw together in the morning for a special breakfast treat. Give this a try! Preheat oven to 375 degrees. Grease bundt pan with non-stick spray. Combine the melted butter and syrup in a small bowl and set aside. In another bowl, combine the brown sugar, cinnamon, and nuts (if desired). Place about half of the syrup mixture in the bottom of the pan. Then sprinkle half of the brown sugar mixture on top. Lay the biscuits on the bottom of the pan, overlapping edges (closely together) to form a ring. Top with remaining syrup and sugar mixtures. Bake at 375 degrees for approximately 20-25 minutes or until golden brown. Cool for 1 minute in the pan, then invert onto a serving platter and enjoy! It's Superbowl Sunday! Although I wish the Saints were playing again this year and feel that they were ROBBED of being in this year, I am excited to go watch the game with our dear friends from Care Group. We are having a potluck of sweets and dips and all good football food, and I can't wait. I love snack foods...it's my favorite type of gathering because you get a great variety of lots of different foods. Chips and dips. Brownies. Cookies. Veggies and more dip. YUM! Can't wait! 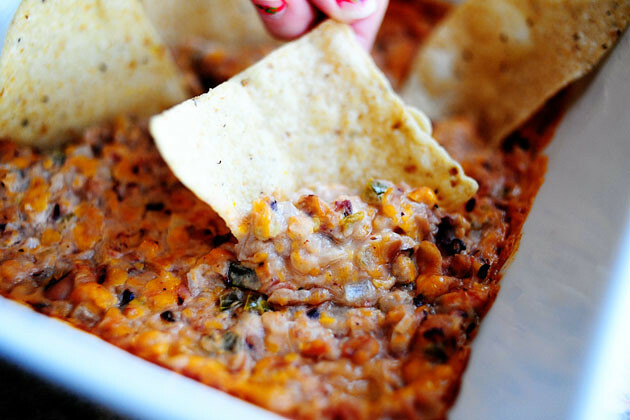 Anyway, tonight I am bringing my new favorite dip: Buffalo Chicken Dip. I have been slightly obsessed with Buffalo sauce since my last pregnancy. Jonathan and I even split some wings for lunch today after church. Anyway, I heard about this dip and tried my hand at it for the first time for a Christmas party. It was gone in a matter of minutes and I have been waiting for an excuse to make it again. I'm sure you and your friends will love it too! Preheat oven to 350 degrees. In a large bowl, beat cream cheese, Ranch dressing and hot sauce until smooth. Fold in chopped chicken until combined. Pour into a greased baking dish. Bake for 15 minutes. Remove from oven and sprinkle with cheddar cheese. Return to oven and allow to bake for an additional 10-15 minutes, or until cheese is melted and dip is bubbly. Serve hot! **** For the Christmas party, I served the dip with Fritos and I also cut up carrots and celery into sticks to serve with it. I thought this was a way to make it seem like Buffalo wings. Also, you could have a small dish of Ranch or Blue Cheese dressing for extra dipping. My husband LOVES pancakes. Let me rephrase that. My husband LOVES pancakes from IHOP. Any other pancake he has tried--be it Cracker Barrel, Waffle House, Mimi's--pales in comparison to those from IHOP. Me? I can't really tell the difference between any of them. However, he swears there is just something special about that International House of Pancakes. So, in an effort to show him how much I love him (and to try out a new recipe), I figured that I would search for a recipe to match them. Surely someone somewhere has spilled the beans about how to make "the" pancakes from IHOP. It didn't take but one quick search for me to find one, so I thought I'd give it a whirl. They tasted great to me....Jonathan said they tasted great too, however he didn't convince me that he liked mine more than IHOP's. That's okay, though! 1. Preheat skillet over medium heat. Be sure to use a pan with a nonstick surface or use butter or nonstick spray to prevent pancakes from sticking to pan. 2. Combine all ingredients with a mixer or in a blender until smooth. 4. Flip pancakes when edges appear to harden, approximately 1-2 minutes. 5. Cook pancakes on other side for the same amount of time, or until both sides are golden brown. I love to take some ripened bananas and smash them with a fork, adding them to my pancake batter for a delicious and sweet treat. Chocolate chips and bananas are also delicious! Any fresh berry added to the batter makes for a great, fruity breakfast. And, my dad's favorite are pecan pancakes! Yum! This is a Pinterest Proven recipe. That means that it is a recipe that I came across on Pinterest that I have actually tried. I saw the picture of these puppies on the website and instantly started to drool. Of course, I had to have an excuse to make them, so since we had friends over for dinner for the New Year, I decided they should have something sweet to indulge in after their meal. Boy are these divine! I will absolutely be making these Carmelitas in the future. Combine caramels and cream in a small saucepan over low heat. Stir until completely smooth; set aside. 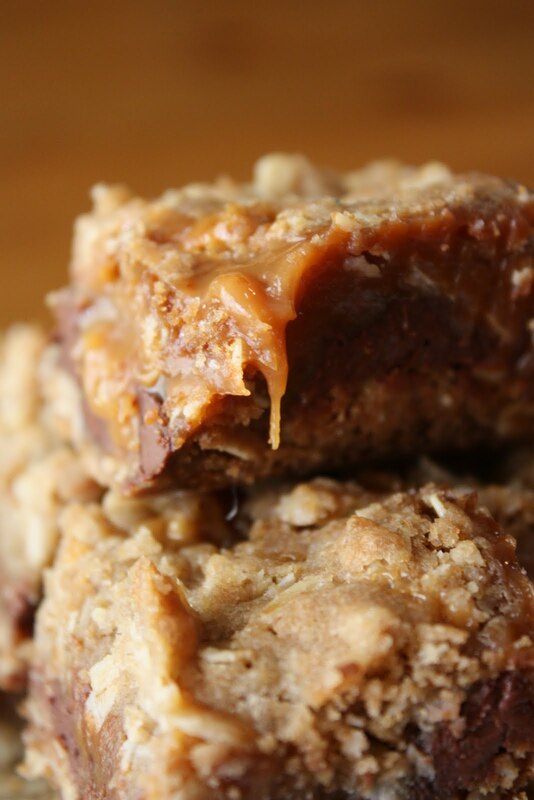 In a separate bowl, combine melted butter, brown sugar, flour, oats, and baking soda. Pat half of the oatmeal mixture into the bottom of an 8x8" pan. Bake at 350 degrees for 10 minutes. Remove pan from oven and sprinkle chocolate chips over crust. Pour caramel mixture over chocolate chips. Crumble remaining oatmeal mixture over caramel. Return to oven and bake an additional 15-20 minutes, until the edges are lightly browned. Remove from oven and cool completely before cutting. *They should be stored and served at room temperature. **To make a 9x13" version, simply double the amounts. I loved how easy these were to make, and I loved that the kids got to help me out a bit. While they unwrapped the caramels, I got the batter ingredients prepared. While the crust baked, I made the caramel sauce, then assembled the rest and let it finish baking. My Carmelitas sat on the counter for a few hours and cooled to room temperature. This was a perfect amount of time to let the caramel harden up a bit. We had a few leftover to enjoy today and the caramel is still so soft and chewy! These are a definite to try. Thank you, Pinterest. And thank you Lulu the Baker for posting this recipe. Where do I begin!? We had a wonderful weekend celebrating the New Year with our little family of five and some friends. Jonathan and I finally bit the bullet and made my grandfather's famous Seafood Gumbo recipe. Since it will fully feed an entire army, we decided we would share the love with some friends, so we invited over a few last night for dinner. Since it was New Year's Day I couldn't NOT have black-eyed peas. SERIOUSLY! So, I ran to the arms (read: website) of my steadfast Pioneer Woman for a grand recipe including the traditional New Year's Day ingredient. Lo and behold, she had a dip recipe that looked delicious, so I figured I would give it a shot. I mean, I had a steaming 4 gallon pot of gumbo on the stove. I didn't need to fix an entire pot of peas, so the dip was just what we needed. It was a huge hit and something I will definitely make again. To make things even better, apart from the can of black-eyed peas, I had everything else in the recipe in my fridge or pantry. Secondly, it took about 3.5 minutes to assemble and 20 minutes to bake. Simple. Scrumptious. Seriously, the pan was empty in now time. Drain black-eyed peas and partially mash, leaving some whole. Add all other ingredients, stirring to combine. Spread into a 1 1/2 quart baking dish and bake for 20 to 30 minutes until hot and bubbly. I'm a New Orleans girl turned Tennessee housewife. Married to my college sweetheart and a stay-at-home momma to three little ones. Welcome to our little kitchen!